I've been really into pancakes lately. But, these pancakes, my friends, are DELICIOUS. They are custardy and creamy in the center, have just the right amount of spice, and will fill you up in a way that the classic, white flour, buttermilk varieties just can’t do. Using coconut flour, instead of white flour, adds healthy fats & protein to the mix. The pumpkin puree comes loaded with micronutrients & fiber. The chia adds a little extra punch of omega-3 fatty acids, and the spices will get your blood moving. Did I mention they’re delicious? Because really, that’s what it comes down to. I just really like pancakes. Combine all ingredients in a medium mixing bowl and lightly whip until well combined. If the batter seems overly thick, add more coconut milk (1 tablespoon at a time) until reaching the desired consistency. 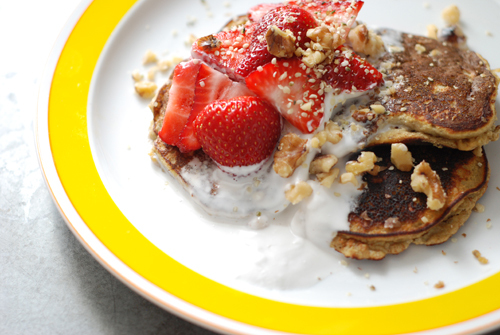 Top your pancakes with coconut cream, nuts, seeds & seasonal berries for extra yumminess & nutrient density. I also like to sprinkle additional cinnamon!